I chose to review The Complete Root Cellar Book: Plans, Uses and 100 Recipes by Steve Maxwell and Jennifer MacKenzie. It sounds kind of intriguing, something I think my parents might like. I have never heard of a root cellar before. The closest I come to having a root cellar is keeping my bag of potatoes in my dark cool pantry room, lol. So if this sounds like something you'd be interested in, let me share some info about this book. 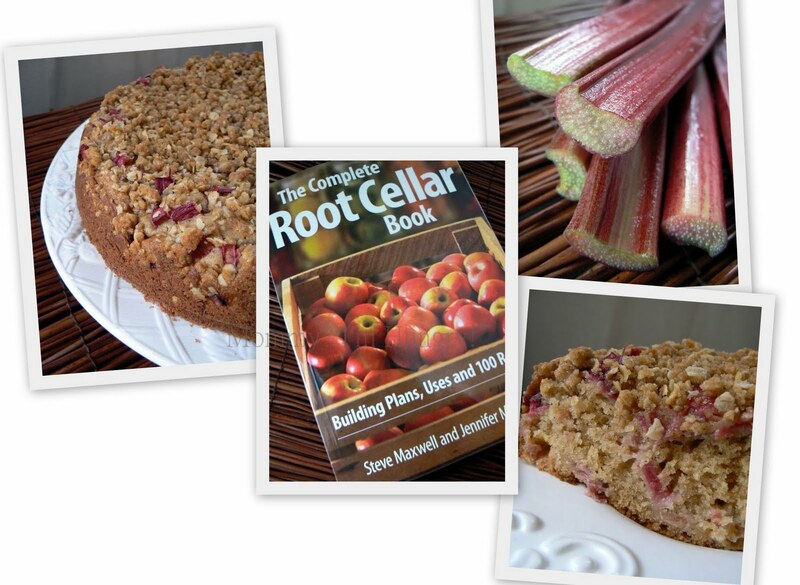 Of course they've included recipes for a root harvest, and I chose to make a rhubarb coffee cake. Scroll down for the recipe! Root cellars are a natural way of storing fruits, vegetables and preserves for longer shelf life and in these hard economic times, root cellars are making a big comeback. Eating fresh fruits and vegetables are important for a healthy lifestyle. But how many times do we go to the store or our local farmers’ market and buy beautiful produce only to have it spoil and go uneaten? For generations, root cellars have been used to store fresh fruits and vegetables in a safe environment. Today, root cellars are making a comeback and a new book shows you how to build and utilize one yourself. THE COMPLETE ROOT CELLAR BOOK by craftsman Steve Maxwell and home economist Jennifer MacKenzie, takes a fresh look at the art and science of building and stocking your own root cellar and eating healthy all year round. Root cellars help us make the most of our food budget by allowing us to stock up on fresh produce at low prices during seasonal harvests. A root cellar can create a lifestyle of healthy eating. The seemingly simple act of visiting your cellar, examining your stores, and carrying something delicious up to the kitchen affords simple satisfactions that can’t be sealed in cellophane. Most people think of root cellars as residing in a home basement or hole in the ground, but THE COMPLETE ROOT CELLAR BOOK changes that perception by providing detailed and illustrated construction guides for making five different and attractive root cellar options, including never before-seen strategies for apartment-and condo-dwellers and homeowners without a basement. There’s truly no better or more natural a way to store food than in a root cellar. Everything you need to know about this time-honored tradition can be found within the pages of this book. degree of ripeness and how much of the plant is harvested. In addition, some produce benefits from certain preparations, such as curing or salting, before it is stored. Steve Maxwell is a cabinet-maker, builder and award-winning home improvement author. He is also a photographer, videographer and seminar leader. He has been helping people renovate, build and maintain their homes for more than 20 years. Steve’s magazine and newspaper articles appear in publications across North America and he is a regular contributor to The Toronto Star, Ottawa Citizen, Canadian Home Workshop, Cottage Life, and Mother Earth News. His “how-to” DVDs, videos and online books have been the favorite of DIYer’s everywhere. Steve, his wife, and five children, live in a stone and timber home they designed and built on their 90-acre farm on Manitoulin Island. Jennifer MacKenzie is a professional home economist, food writer, editor and cooking instructor, with over 15 years experience in recipe development and testing. In 1999 she started her own food consulting business, FOODWORX, and shares her passion for delicious, easy-to-make, nutritious food in several national and regional publications. Jennifer has been the official Milk Calendar recipe developer for the past several years, and is a familiar face to consumers on CHEX Television on NewsWatch where she can be seen cooking up tasty and nutritious recipes on-air. Jennifer is the co-author of several best-selling cookbooks including The Complete Curry Cookbook, The Complete Book of Pickling, The Dehydrator Bible and The Complete Trail Food Cookbook. In 2005, Jennifer, along with her husband, Chef Jay Nutt, opened Nuttshell Next Door Café, a friendly, neighborhood gathering place. Jennifer has served as a canning competition judge for several years in Canada and lives in Buckhorn, Ontario. This rhubarb coffee cake is really good! Even better the next day as it becomes even moister when wrapped up. If you like rhubarb, you ought to try this recipe! Trust me, it's really good if my kids helped eat it all! If you’ve grown rhubarb in your root cellar, dazzle guests with this moist cake topped with a crispy streusel, long before their garden rhubarb is ready. 1. For the streusel: In a bowl, mash together flour, brown sugar, oats, cinnamon and butter until crumbly. Set aside. 2. For the cake: In a bowl, combine flour, baking powder, cinnamon, baking soda and salt. 3. In a separate bowl, using an electric mixer, beat brown sugar and butter until fluffy. Beat in egg and vanilla until blended. Using a wooden spoon or rubber spatula, stir in flour mixture alternately with yogurt, making three additions of flour and two of yogurt. Gently stir in half the rhubarb. Spread into prepared pan, smoothing top. 4. Sprinkle the remaining rhubarb over batter in pan, then sprinkle with streusel. Bake in preheated oven for 50 to 60 minutes (mine was done at 50 mins) or until a tester inserted in the center comes out clean. Let cool in pan on a wire rack for 20 minutes. Run a knife around the edge of the cake and remove ring. Serve warm or let cool completely. I wrote this review for "Mommy? I'm Hungry!" about The Complete Root Cellar Book. I received free product to keep for this review. All opinions for this review are that of myself & family. Product info & stock images provided by PR. I love rhubarb, but you sure don't find it growing where I live now. Heading home to NY next month so I will have to pick some and try this recipe when I get back. Looking forward to trying this -- we love rhubarb but never had it in a coffee cake! Thanks!